Isn’t learning more fun when it isn’t done in a classroom? Reserve your child’s spot in a Terrapin Adventures summer camp. No School! It’s the first thought on every child’s mind as summer approaches. This simple two word phrase is the only motivation they need to power through those last few weeks of the semester. Then it is three months of freedom. However, summer can get pretty boring pretty quick without some sort of structure, which is why so many parents send their kids to summer camp – more than 11 million children in the United States, according to the American Camp Association (ACA). Summer camp is a great way to get your children up and active, and away from the television and video games. Summer camp is also a great way to instill several life lessons in your children in a fun and creative way. Isn’t learning more fun when it isn’t done in a classroom? Now for the million dollar question – “How can my child benefit from summer camp?” Well, there are actually several different ways. Socialization: Nowadays, children are spending more and more time indoors, in front of computer screens, television screens, and handheld gaming systems. It is important for children to get up, get moving, and socialize with other children their age. These types of experiences are incredibly important for social development. Exercise: Summer camp is action! Instead of sitting down and watching TV or sitting down and playing video games, your child will spend the summer (or at least a week of it) running, swimming, jumping, hiking, climbing, and having an adventure. Stay Mentally Sharp: The National Summer Learning Association (NSLA) reports that most students lose about two months of grade level equivalency in mathematical computation skills over the summer months. Summer camp helps keep your child mentally sharp by challenging them daily. Life Lessons: Children love to crawl, climb, and swing, which is why summer camps focus on experiential learning – learning by doing. Camp will help teach your child several life lessons, such as confidence, self-reliance, resiliency, outdoor skills, and even teamwork and leadership skills. These are lessons they can apply in their everyday lives…for the rest of their lives. Terrapin Adventures Summer Camps – Discover Your Child’s Inner Adventurer! Terrapin Adventures in Savage Mill, Maryland offers three fun-filled Adventure Camps designed to give your child the thrill of a lifetime while also teaching several important outdoor and leadership skills. Our Ultimate Adventure Camp, designed for ages 8-14, lets your child step outside of their comfort zones on our one-of-a-kind Challenge Course as they traverse and conquer all three levels of our 40-foot High Ropes Challenge Course. We have teamed up with Earth Treks for our Rock N’ Adventure Camp, a five-day camp designed for ages 10-14 that exposes kids to all kinds of adventure including rock climbing, zip lining, mountain biking, our high ropes challenge course, and more. 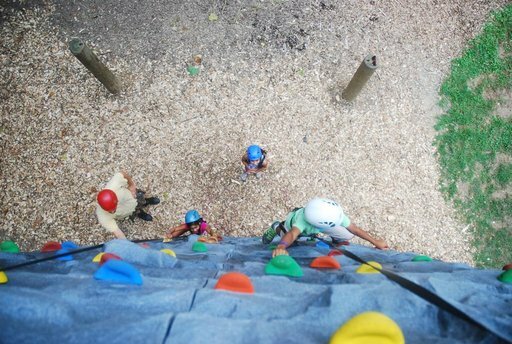 Finally, our Adventure Expeditions Camp, designed for ages 12-15, includes a 3-day 2-night visit to Patapsco State Park for a true outdoor adventure then 2 days of climbing, soaring and exploring atTerrapin Adventures. We maintain a ratio of one Camp Counselor for every six campers, ensuring your children receive the personal attention they deserve as they soar through the air, defy gravity, and enjoy some amazing outdoor adventures! Our camps are limited to 24 campers per session and slots are filling up fast. Don’t forget to take advantage of our 2nd week and sibling discounts. If you have any questions about any of our summer camps, please call Terrapin Adventures at 301.725.1313, or email us at info@terrapinadventures.com. You can also follow Terrapin Adventures on Facebook, Twitter, LinkedIn, YouTube, Google+, and Pinterest for up-to-date information on events, trends, and other fun and exciting outdoor activities. This entry was posted on Tuesday, June 2nd, 2015 at 2:48 pm. Both comments and pings are currently closed.